In this bright, bold picture book, a cast of animal characters are building a brand-new playground in a local park for their community! Each day of the week contains a different construction plan as the steam-rolling, digging, and planting gets underway. Jean Reidy is a two-time winner of the Colorado Book Award. Especially gifted at writing for very young children, Jean is a frequent presenter at national and local literacy, writing, and education conferences and at schools across the country—in person and via Skype. She is a member of the Colorado Council International Reading Association and the Society of Children’s Book Writers and Illustrators, and she serves on the board of Reach Out and Read Colorado. Jean writes from her home in Colorado where she lives right across the street from her neighborhood library, which she visits nearly every day. Visit her at www.jeanreidy.com and on Twitter: @JeanReidy. 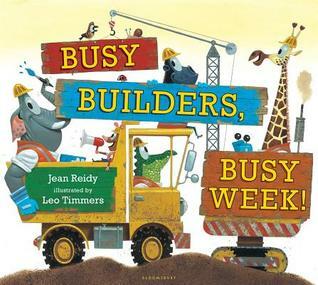 Reidy and Timmers have created a delightfully fun book perfect for construction-oriented story times. The rhymes are fun to read out loud and even to have the listeners repeat. I like texts like this because they feel so fun rolling off the tongue. This is the sort of text that helps children realize just how much fun words can be. The construction theme will undoubtedly be a hit for many young children as well the surprise at the end. Timmers' bright, colorful, engaging illustrations provide lots of details for children to look at and laugh at (the animals really skinny legs for one). The book also works really well for helping children develop visual literacy as they study the clues and try to figure out what the animals are building. There is more than one perfect spot to stop and let young listeners figure out what the end result is going to be. 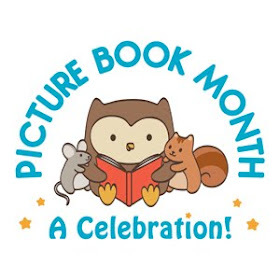 A delightful picture book that will provide a lot of fun for young readers and listeners. I couldn't help myself from reading the excerpt aloud--what a great read-aloud!